Hush, Mizraim and Phut were also born from Ham. Hush gave birth to Nimrod. We do not know how Ham and Hush were looked like but the figure of Nimrod is widely represented in the Ancient Babylon monuments. Everywhere he is represented carrying a headgear with two horns (the gear with two horns symbolized being opposite to God and was an attribute of all Sumerian gods. Later it was taken by the Ancient Egyptian Isis) and twice as tall as all other people. The Bible says that «he began to be a mighty hunter before the Lord» (Gen. 10:8). The word "mighty " was translated from the Jewish word “gilor” which means “tyrant”. 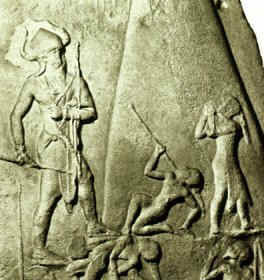 Nimrod hunted not for animals, but for people, making them his slaves, and thus counteracting God. He was the king of Babylon and the chief of construction of the Babylon tower. He wanted to create his own religion which after his death his wife Semiramith completed. 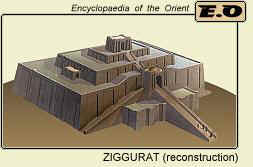 The Babylon tower was none other than ziggurat - the cult tower of the peoples of Mesopotamia, similar to towers of Aztecs and Mayan, where human sacrifices were made. Nimrod was perceived by the people as the god not only because he was so big but also because he had some mystical abilities. Nimrod was a giant, angel-human hybrid. So, Ham had a different father – an angel, or an angel-human hybrid: Naphelim or Elioud, and Noah guessed or knew about it. That is why 11 nations (Deu.7:1-5; Deu.20:16-17; Gen.15:19-21; Ezra.9:1) ): Hittites, Girgashites, Amorites, Canaanites, Perizzites, Hivites, Jebusites, Kenezzites, Kadmonites, Rephaim - Ham's line offsprings (Gen. 10:15-17), God gave back into the hands of the Jewish people on utter annihilation. He wanted to lower to a minimum the distortion of the human genetic heritage. However further in the Bible it is said about the giants – sons of Enak (Num.13:33, 34); about huge Emims (Deu.2:10, 11) and Rephaims (Deu.2:20, 21; Deu.3:11; Deu.9:2; Josh. 12:4; 2 Sam.21:20; 1Chron.20:4). This was in 2000 years after the Flood. Where did they appear from? Two versions are possible. The first is that mutation genes were so strong, that they could be kept during such a long period. But it violates the laws of nature. The second point of view is more probable, namely: some angels after the Flood continued to run into a sin. This point is not deprived of the bases. Look, according to the book of Enoch, 200 angels before the Flood incorporated to the Satan, and in Revelation (12:4) it is said that the Satan carried away one third of angels before Jesus' birth. How many is one third do you think? Do you remember what Jesus answered Peter when he cut an ear to one of those who came to arrest Jesus: « Thinkest thou that I cannot now pray to my Father, and he shall presently give me more than twelve legions of angels?» (Mat. 26: 53). The Roman legion included 6 thousand solders. That means that we can suppose that more than 36 thousand angels by the time of Christ's birth followed the Satan. And if God the first " angels who did not keep their proper domain, but left their own abode, He has reserved in everlasting chains under darkness for the judgment of the great day" (Jude 6, 2Pet.2:4), these 36 thousand sinned after the Flood. Studying attentively the 10th chapter of the Genesis, you can notice, that in the Bible it is said about the offspring only of three Ham's sons - Hush, Mizraim, and Canaan. Where did off springs of Phut, the fourth son of Ham , get to? As you remember, the brothers divided into their families after the wreck of the Babylon tower, when God had divided languages. After that, according to the map in The Nelson Study Bible (New King James Version, Thomas Nelson Publishers, Nashville, 1997, p. 22), from Hush and Canaan the peoples of Near East came: Amorites, Canaan, Philistines; and Turkey - Hittites. Mizraim's off springs settled down in Egypt. And only Phut was in the western point of area of settling of all Noah's sons: in present Africa. Let's think: the ground of Africa is not the best. Mizraim occupied the most fertile lands: about the river Nile. Of course, Phut moved more and more to the West. And then the Bible says that earth was divided with the birth of Peleg, son of Eber (great-grandson of Shem .Gen.10:25). The Earth was divided and gradually it began to move away from the origin continent. 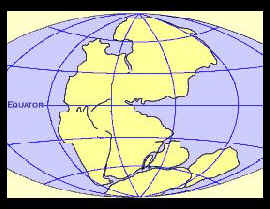 So Northern and Southern America appeared, which population from Alaska up to the most southern point: Cape Horn, according to Collier’s Encyclopedia (Crowell Collier and Mac Millan, Inc., 1967), consists of one ethnic group - Indians (in Russia this is the Mongolian race which had arrived from America through Alaska). They are Phut's offspring. So, trusting the Bible, it is possible to solve all insoluble riddles, such as: why the ritual towers of American Aztecs and Maya are so similar to Babylon ziggurats; or how did the ancient Sumerian texts, recently found by the archeologists, get on territory of America; and why the Egyptians, as well as the Indians, differed by a red shade of a skin.